REVIEWS FOR SHOPLANDIA, the new novel by Jim Breslin published by Oermead Press, are in. Shoplandia launched on May 15th at Chester County Book Company and is available through bookstores, IndieBound and Amazon. In addition, Jim Breslin is offering personalized copies sold direct from the author here. 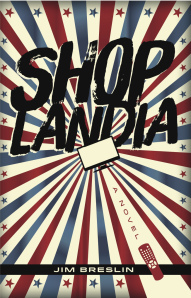 “With a tone and style reminiscent of George Saunders and situations that would feel right at home in a Don DeLillo novel, the stories collected in Jim Breslin’s Shoplandia offer an engaging and informed behind-the-scenes look at the home shopping industry.” – Marc Schuster of <em>Small Press Reviews</em>. Read the full review here. You can read Jillian’s entire review by clicking here. But wait, there’s more! Check out the reviews posted on AMAZON and GOODREADS. Have you read SHOPLANDIA? Enjoy it this summer and join the discussion!